The United States Congress designated the Semidi Wilderness (map) in 1980 and it now has a total of 250,000 acres. All of this wilderness is located in Alaska and is managed by the Fish and Wildlife Service. Before it became Wilderness or a subunit of the Alaska Peninsula Unit of the Alaska Maritime National Wildlife Refuge, these nine major treeless and ragged rock islands, some sided with precipitous cliffs, were combined with many small rocks and islets to form Semidi Islands National Wildlife Refuge in 1932. More than 2.4 million birds, almost half the breeding seabirds of the Alaska Peninsula Unit, nest on the Semidis. 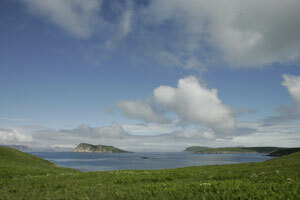 Aghiluk Island alone, the largest of the Semidis, is home to more than half a million birds. About 370,000 horned puffins nest in the Semidis along with almost all of the unit's northern fulmars and jaegers, and one million-plus murres. Ancient murrelets and parakeet auklets are among the other species found here. Seabird populations would be even higher, but fox farmers in the 1880s released their animals on some of the larger Semidis, and their descendants consume many eggs and birds annually. Semidi Islands Wilderness Area is not great in land mass but includes approximately one-quarter million acres of surrounding seabed, providing at least temporary homes for sea otters, sea lions, seals, porpoises, and whales. The islands themselves rise as high as 846 feet above sea level. Exposed to the stormy Gulf of Alaska, drenched by frequent rains, remote and difficult to reach, lying in poorly charted waters, this region is seen by few humans. The dangerous crossing of an unpredictable stretch of sea is simply too great a risk for most. Planning to Visit the Semidi Wilderness? How to follow the seven standard Leave No Trace principles differs in different parts of the country (desert vs. Rocky Mountains). Click on any of the principles listed below to learn more about how they apply in the Semidi Wilderness.